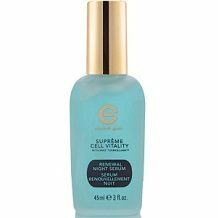 Elizabeth Grant Suprême Cell Vitality Renewal Night Serum promises to reduce the appearance of wrinkles and improve skin firmness so that skin is smoother. It also serves to hydrate the skin so that it has a radiant look. It is suitable for all types of skin. The purpose of this review is to determine if this is the best product to purchase for customers who are looking for a night serum that reduces wrinkles. The first ingredient listed is a patented development by the manufacturer themselves which has been shown to smooth out the appearance of fine lines and wrinkles. CoQ10 is an antioxidant that reduces the impact of harsh chemicals on the skin that normally cause accelerated aging because of their damaging properties. Niacinamide has a similar effect but it is also a vitamin that can nourish the skin cells. Algae extract contains a variety of proteins and signaling molecules that can stimulate the skin cells to grow out more fully to improve the appearance of the skin. One or two drops of can be placed onto the fingertips and then massaged gently into the face and neck area. The manufacturer recommends applying another moisturizer afterward. In our opinion, this makes the product less useful as it requires another one to demonstrate it’s full benefit. The manufacturer really should have included everything in one product so that the customer gets the best results they can without having to purchase several products. It will cost a person $120 to purchase 3 fl oz of this product. The product is shipped without added delivery charges because it exceeds the amount of $75. If other products, or this product with a discount, are purchased and they are not above $75, then a shipping cost will apply. Free shipping is only applicable within North America. We could not find any source of discounts for this product in terms of buying in bulk or subscribing for the repeat order but the manufacturer does have specials that run for a particular period of time. Only products which have not been used or opened can be returned. The manufacturer must be contacted within 30 days of delivery for this to apply. Shipping charges are only refunded if there was an error on the manufacturer’s side. This returns policy is not particularly useful for customers who have opened the product and tried it but are not happy with the results. In this case they are sitting with a product that does not work for them and they will have lost a very large amount of money for this product. There is a fair amount of scientific research to support the ingredients that the manufacturer has included in this product. The instructions for this product are also quite easy to follow but it does concern us that the manufacturer suggest using another product on top of this one. The price of this product is very high if customers consider that they are not protected by any sort of guarantee. It is a lot more logical to seek out a product that is covered by a guarantee so that whatever you pay, you are not at risk.